This is personal anecdote about how to re-connect to a disconnected wifi bridge if your main AP is off/broken. So 2 weeks ago the ADSL Modem (AP including LAN DHCP server) died but in the network I continued seeing the SSID. 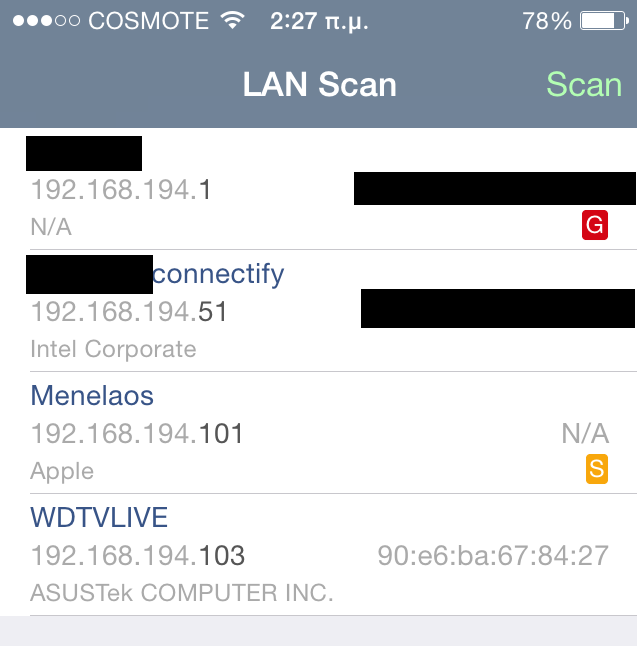 After scanning the network we saw that the ASUS wireless bridge transmits with the same SSID as the ADSL modem / AP. 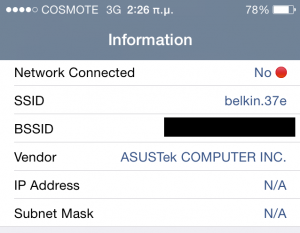 The actual modem is a Belkin but the wireless bridge uses the same SSID as seen below from an iphone app called “Net Analyzer”. By simply creating my own access point with the SSID, password, and encryption settings of the original Access Point I “forced” the Asus bridge to connect to me and give me access to that part of the network. Any access point could be used but personally I used connectify to turn my laptop into an AP. 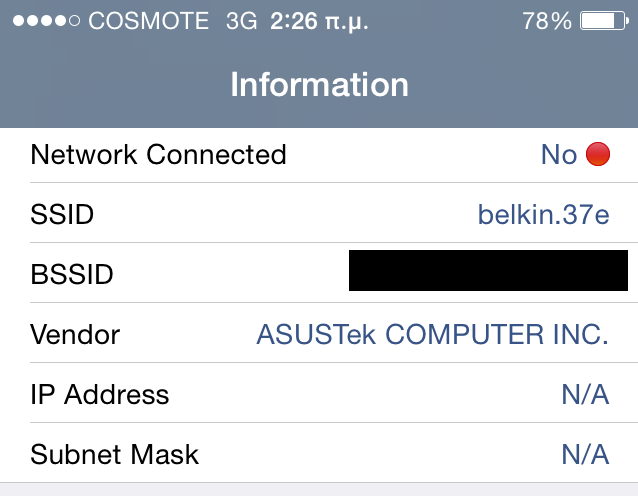 Above we see a screenshot of the Connectify Hotspot (or Access Point) setup. Below we see screenshots of what the iphone displayed upon connection to this “Access Point”. Above we see the that now the scan shows a different AP with the same SSID and since my laptop is the DHCP server IP addresses are available. The WDTLive media player looks to be AsusTek since it is connected by ethernet directly to the bridge. So, if you know the SSID, password, and channel of where a wireless bridge connects to it is possible to hijack it and make it connect to you. Finally, what do you do if you do not remember the password, encryption, or other settings? There are applications to view such saved settings from windows including WirelessKeyView . Programatically Access Statistics from 3G Mifi/Access Point! !